Germany-based Evonik has started up production for the phthalate-free plasticiser 1,2-Cyclohexa dicarboxylic acid diisononyl ester at Marl Chemical Park with an annual production capacity of 40,000 tonnes. 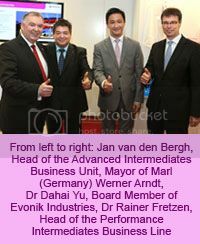 Investment was in the double-digit million euro range. The phthalate-free plasticiser is sold under the Elatur CH brand name. 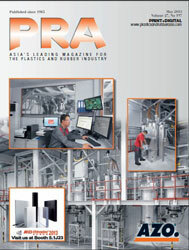 "Consistent research will help to add further innovative products to the new generation of plasticisers. This includes marketing bio-based plasticizers that Evonik plans to launch additionally under the Elatur brand name. Negotiations with cooperation partners are at the final stage," said the firm. To develop the plasticisers further, Evonik operates its own research and development laboratory at Marl Chemical Park, offering also technical customer service. The expansion of the portfolio with phthalate-free and bio-based plasticizers is an ideal addition to our existing Vestinol product family that has been tried and tested for decades, explains Dr. Rainer Fretzen, Head of Evoniks Performance Intermediates Business Line. With our new plasticisers from the Elatur brand, our customers now have an even wider portfolio from which to choose the plasticiser that best suits their individual requirements. We thus offer our customers a complete service including logistics and technical support from a single source. Plasticisers from Evonik are primarily used in the plastics, automotive, and construction industry.